Don't be! It is very seldom heard in Australia that someone has been killed by a spider. And that's despite the fact that we love to spend a lot of time outdoors, camping in the bush, which is when you are most likely to come across spiders (as well as snakes and other dangerous animals). Yes, there are some poisonous spiders but they are easy to avoid and they are not altogether that poisonous. With the antivenoms available, all you have to do is to get to the hospital. Click on the link above to read more about the subject. 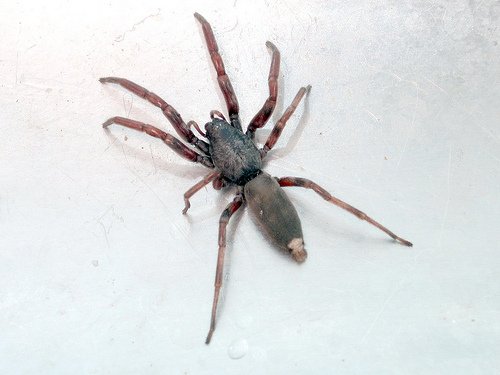 Below is more information about what types of spiders there are in Australia. There are two large groups of spiders in Australia - primitive and modern spiders. You don't often see the primitive spiders because they don't make webs at all. They live in hollow nests in the ground and most of them only get out to forage night time (some of them make funnel-looking web-like structures around their hollow entrances but they don't make webs to catch prey). They tend to be large, dark in colour, and they live very long - up to 20 years which is why they are called primitive. Having such slow generation turnover has made their evolution very slow and this is why they haven't evolved the silk to build proper nets. They have a few other disadvantages such as poor eyesight. Because they lack nets the only way to catch the prey is to poison it. The spiders in this group tend to be more poisonous than the modern spiders. Australian tarantula - bird eating spider. 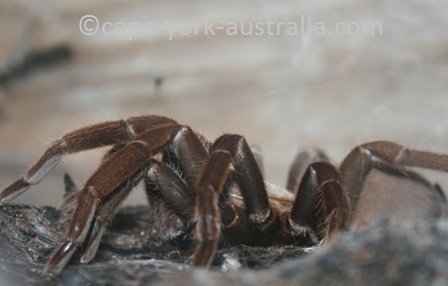 The group contains many species of trapdoors, funnel webs and mouse spiders. 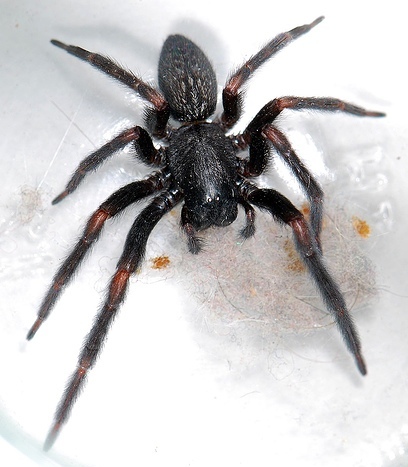 The most poisonous ones are funnel webs, which live in New South Wales and south-eastern Queensland. 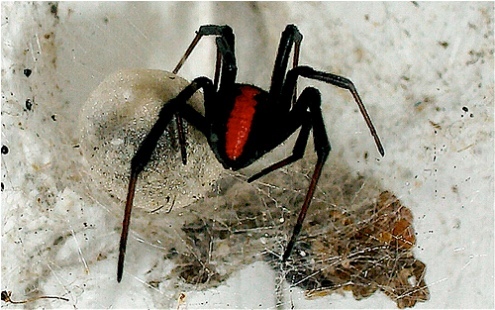 Modern Australian spiders only live a few years at most, and with a quicker generation turnover have evolved much more. That said, some of them still do have poison, and do use it to kill the prey once they have caught it in the net. These spiders can be divided into four groups based on the level of their evolution. These are Australian spiders that still live on the ground, but (as opposed to the primitive spiders that wait for the prey to come to them), take the 'step' to find a prey and hunt it. 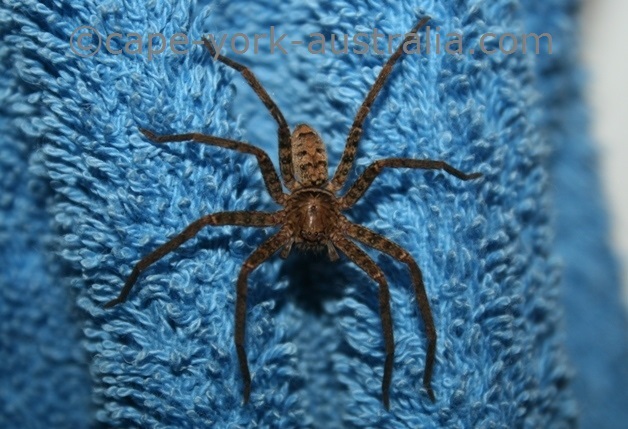 They include spitting, jumping, nursery web, wolf, sac and huntsman spiders. Some of the more infamous ones in this group are Fiddle Back, Garden Wolf and White Tailed Spider. They are known for their 'poison' however nobody has been killed by them! Huntsman spiders are known to be harmless however some species can still give you quite a bad bite that may get infected for ages. These spiders have left the ground, but they still don't build proper spider webs. Most of them are nocturnal, and they live up in trees, or in scrubs and flowers, where they are looking for insects. They don't have any venom, and they include crab, triangular, orchard, mimicking and net casting spiders. Exactly as it sounds, these spiders pioneer the net building and consequently most of their diet consists of flying insects. They build three dimensional, messy nets, often in cavities in tree trunks, caves and rock ledges. Some of the spiders in this group are considered dangerous, such as Black House Spiders and the infamous Redback - however they are not nearly as 'deadly' as they have made sound. Yep, that's the pro level in web building and spider evolution. These spiders only use their energy for building nets in insect flight paths and then just sit there and wait for the prey to fly into the net. No energy needed to develop poison, or run around finding the insects and hunting them down. These are the most successful spiders, and also the ones that you most often see - they don't hide in corners, and they are there, easy to spot day or night. Their two dimensional nets are perfectly designed for minimal use of silk and maximum speeds when moving across it. 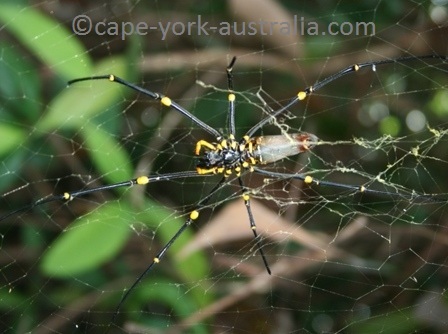 They include Wheel Weaving Garden Spiders, St Andrews Cross Spider, and the famous and beautiful Golden Orb Weavers. They are all harmless.